With a name like, “Dinosaurs,” you can expect big things and this spot absolutely delivers. While it’s not 100% plant based, they have a rockin’ option that is Vegan, and best of all, they use Vegan Mayo! Hayoooooo! If you’ve kept up with my taste in food, you know I just love myself a good Banh Mi. So, where else can you go get that in San Francisco, where they use Vegan Mayo? I don’t think anywhere else! Untapped market? You bet! Aside from the mayo, let’s talk about the sandwich itself. 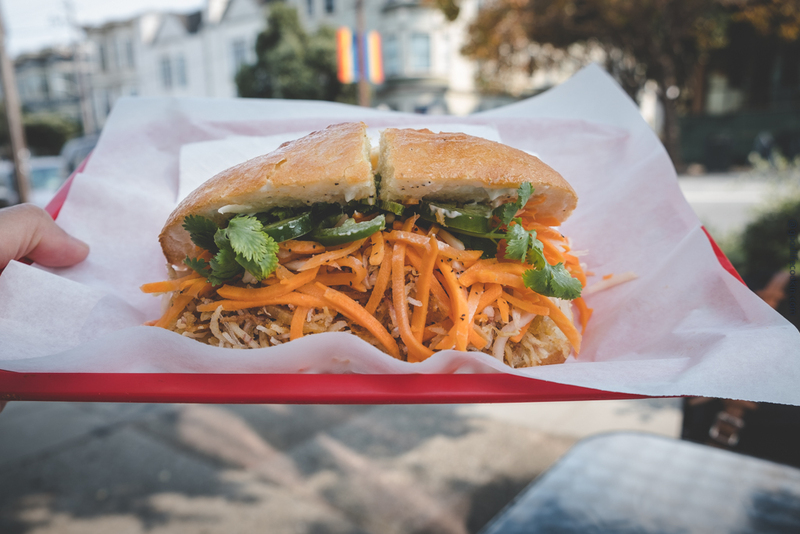 They call their sandwich a, “Crispy Tofu Banh Mi,” and you would think that you’re getting something like a deep fried block of tofu in between a french baguette. That’s not the case with Dinosaurs. What you’ll get is a nice cocktail of shredded crispy tofu, deep fried bean thread noodles, fried taro shreds, all dusted in a wonderful toasted rice powder. In Vietnamese cuisine, this is called, “Bi Chay,” and it’s a plant based substitute for a very popular shredded pork often served with Vietnamese rice plate dishes. Putting this on a banh mi sandwich though?! That’s ingenious. It’s so right and the flavors go perfectly with the pickled carrots, fresh cilantro, and sliced jalapeño peppers. Did I mention the Vegan Mayo? But wait! There’s more…they use their Bi Chay inside their spring rolls! Yes, you heard it folks. Rice paper wrapped Bi Chay, with crisp apples, lettuce, and mint leaves. All dipped in a lovely rich peanut sauce!! Hellooooooo flavor bomb. I believe there are several locations to go visit in the city, but I typically visit the Castro district one and I believe that is their original location. You can also do a ton of good shopping in the Castro District! Perhaps visit Local Take for some dope shirts, or visit Giddy for some Vegan gummy candies. You can also hit up Hortica, for purchasing your next succulent or indoor plant! All is well, when you’re roaming around the city on a stomach full of Banh Mi. Give Dinosaurs a try if you haven’t, and definitely let me know how you liked it!